Today was the best I’ve felt in the last five. The reason can be stated in one simple word: slackpack. With only a light pack containing food and water, I not only stayed vertical, but regained some much needed confidence concerning the balance issue. I even managed some rock skipping over water and didn’t seem to mind as much the boulders at higher elevations. 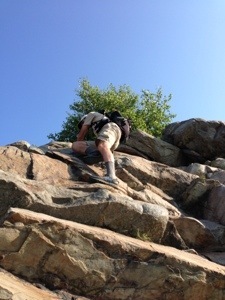 Plus it was much easier to pull myself up the rock scrambles wearing a light pack. So despite the continued heat and humidity, I knocked out 19.8 miles while hiking alone all day. Even though the hike took almost eleven hours, I wasn’t totally exhausted at its conclusion. I could have probably gone at least a half mile more…maybe. And now back to the regularly scheduled program; I mean back to the hike. I started the walk up Arden Valley Rd. 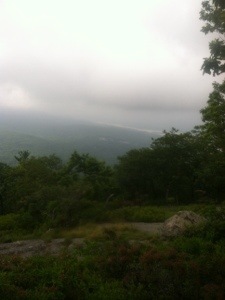 in Harriman State Park at 7:20. 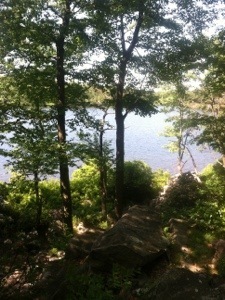 With the sun already beaming down, I was sweating profusely after the nearly 800 foot climb up Island Pond Mountain. Along the way I had to pass through the infamous Lemon Squeezer, a narrow stone passage that requires a sideways navigation. Since I was slack packing, I kept my pack on; however, it did scrap the sides of the rock occasionally. 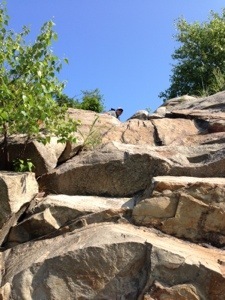 After the Squeezer, a rock climb and scramble followed. 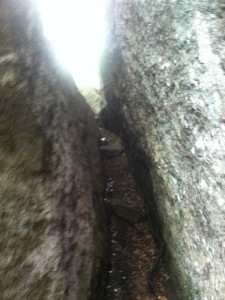 With the lighter pack I was able to handle the challenging section without too much difficulty. As the morning progressed I met several day hikers and some southbound sectioners. I talked with one group from Jersey that had a bird watcher with binoculars in its party. I took a pic of Erin and her dog Riley after I told her about Don and his love of dogs. Around noon I took almost a half hour break for lunch at the William Brien Memorial Shelter. It was one of the most run down I’ve seen on the entire trail. 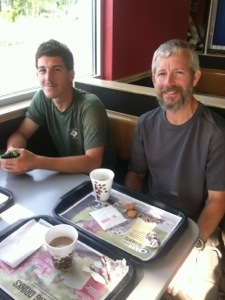 While eating, I chatted with a father and son, Howard and Jordan who had just begun their hike today. I would see others throughout the afternoon, but stop to talk with none. The trail today actually offered up a good deal of variety. As I’ve already stated, boulder climbs and rock scrambles were prominent. 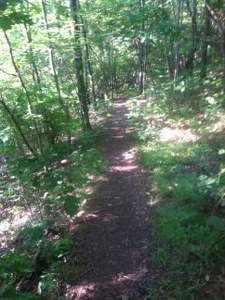 Occasionally, a gentle trail allowed for some faster walking. There were also sections with foliage bordering on both sides. Like yesterday, I almost stepped on another deer. This one just looked at me as I snapped her picture. The trail also offered up several spectacular views. Even though clouds rolled in, in the afternoon, visibility remained fairly good. I paused for a few minutes atop Black Mountain to chat with thru hiker Cocoon, a young man who is taking his time to really observe nature and to write some poetry. He was the only thru hiker I would see all day. 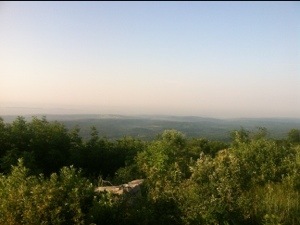 There were also beautiful views from West Mountain. On Black and West the trail stays on the ridge for quite some time, with the views in the distance. Eventually I made my way to Bear Mountain. The ascent is different from when I section hiked here in 2005. 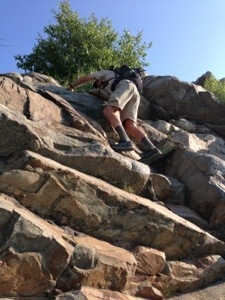 A rock staircase provides an easy route for much of the climb. Easy for most, that is. I fell off near the bottom, but I didn’t fall. 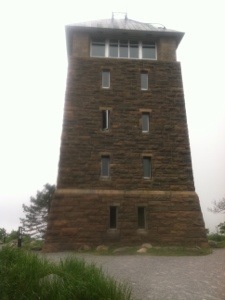 At the apex of Bear stands Perkins Tower, from where a view of NYC is visible on a clear day. 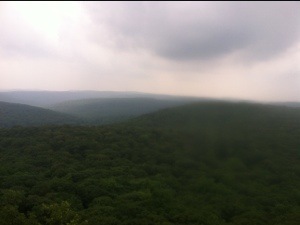 By the time I reached the top, the sky was overcast. 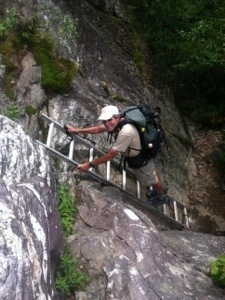 The descent also consisted of hundreds of rock steps. I wondered how long this project took. At the crest scores of people strolled or lounged around the area. 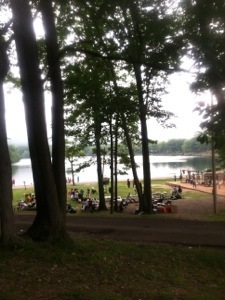 Even more were busy at a variety of activities in the park or by the lake at the bottom of the mountain. The AT follows a path around the lake for awhile and then goes through the Bear Mountain Zoo. The bear cage in the zoo is the lowest point on the entire trail at 166 feet. Unfortunately the zoo closes at 4:30, so I had to walk back up to the park and out via a road since the blue blazed trail was closed for work as well. John, a park employee and retired NYC fireman from Brooklyn, left his post to walk me to where I needed to go to get out of the park. When I told him I had gotten a ride with another retired NYC fireman in Greenwood Lake, he said he knew Gene who was a good friend of John’s brother. Small world, we agreed. Since the white blazes weren’t available today, I’m glad I got to walk through the zoo on my section hike. So tonight I’m back at the Bear Mountain Bridge Motel. I’m planning another slackpack for tomorrow to Dennytown Rd. It’s pricey, but I need to do what I need to do to get this hike done. The hike was again fun today. The trail offered variety and I was fairly comfortable, considering the weather. No day is going to be easy; however, if I can maintain that positive attitude, and maybe get a little support, Maine is within sight. Not really, but it will be soon if I just keep putting in the miles on the Appalachian Trail. NY 17 at Arden Valley Rd. “Old age hath both its honor and its toil,” stated Tennyson in his poem “Ulysses.” Today I felt old. 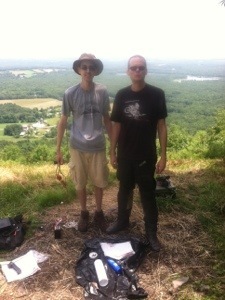 I don’t really consider there to be any honor associated with this hike, but there sure is a lot of toil. It took me over seven hours of hard work to cover a mere 12 miles on another hot, humid, buggy day in New York. With multiple rock scrambles and several areas of poorly blazed trail, my frustration level was exceeded by early afternoon. If not for the knowledge that I would again be sleeping in a bed and eating a restaurant meal later in the evening, the hike would have been unbearable. OK, I sound like I’m whining. I suppose you could say I am. When my alarm sounded at 7:00 I had to coax myself out of bed to resume the walk. I bid Breezy Point adieu and headed back toward the trail via HWY 210. After a quick stop at the Country Grocery, I started looking for a breakfast establishment. Murphy’s, a bar and grill with a prominently displayed sign advertising country breakfasts on weekends, caught my eye. Two couples dined on the front veranda; however, I was the only patron in the dining room. (Note the use of the semi-colon, if you’re reading this, Chin Music.). Strangely enough, several folks were already at the tavern. Some were at the bar; others were shooting pool. My breakfast was quite appetizing even though I still couldn’t get grits. The portion of eggs looked outrageously large. It seemed more like four than two. While eating, I inquired of my waitress if there was a taxi service in town. The bartender called for me and even paid the $10 fare. That was some good magic to start the day. Before I left the restaurant one of the ladies who had been dining outside stopped by my table to ask about my hike. Mary, the local librarian, asked, “Are you having fun?” “No,” I replied. For a second I couldn’t believe how quickly and easily I had uttered the word. Finally, I’ve said out loud, “This hike really isn’t very much fun.” We chatted briefly about its perils until my cab arrived. When I got back to the AT I met Jeremiah, a hiker whose name I had seen in the registries but not encountered on the trail. I hiked up the trail ahead of him and didn’t see him again until the end of the day. From the beginning of today’s hike I kept asking myself why I had remembered this section as enjoyable. My memory is fading fast. It was downright treacherous and frustrating, (from this old man’s perspective) all day. Beginning with the Eastern Pinnacles, I found myself using my hands often. What concerns me more and more is how tentative I have become on dangerous sections. 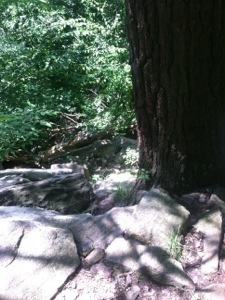 At one point I sat down to negotiate a rock about ten feet long and three feet across. A short while back I would have just strode over it. Noticing that there were potentially fatal drop offs on both sides, I just couldn’t do it. I fear I have lost my confidence in my balance. With the most difficult part of the hike still remaining, I need to regain it. 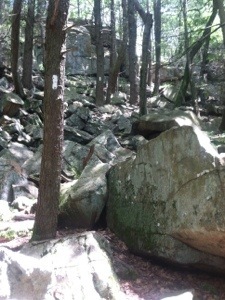 When I got to Cat Rocks, I took the trail around rather than use my hands to climb up the boulders. It was the first time I have done that. I just don’t feel steady these days. Other than because of the falls, I don’t know why. The other issue with today was the blazes. At least a half dozen times, I had to wander around looking for a blaze to be sure I was hiking on the trail. So much of today’s trail was undefined. It was leaves, rocks, and roots, but often without a clearly defined pathway. And like the past two days, the heat and humidity slowed me drastically. I was already so depleted after 6 miles that I decided to change my plans for the night. I called the Bear Mountain Bridge Motel and made a reservation. Then I arranged a ride. Four hours later I was thankful I had. There were, however, some positives today. Fitzgerald Falls with the adjacent AT steps captures all that is beautiful on the trail. I also disrupted a doe from her nap. 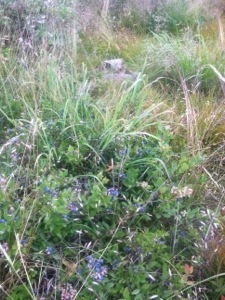 In fact I almost stepped on the deer who was resting no more than a yard off the trail. 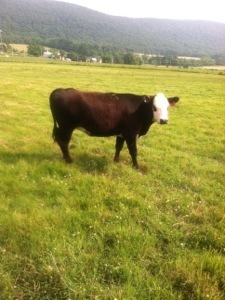 She stood up, looked at me walk by, and then continued grazing. I also saw a snake sunning itself. I think it was a non-poisonous one. 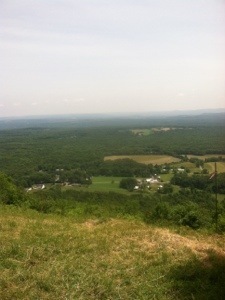 At the top of Arden Mountain I enjoyed a nice chat with two day hikers. They knew little about the trail, so I shared my website with them. They also gave me some information about the area. 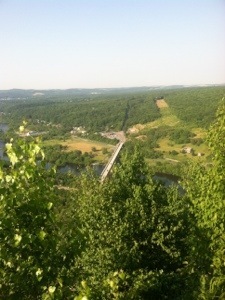 After leaving them I gingerly descended a steep, rocky section to NY 17 from where I would ride into Fort Montgomery. Unfortunately I had to wait over an hour for the ride. The trail today again offered a variety of challenges. Since I stayed vertical, I met most. Still, it was hard. I found myself thinking of Medicine Man and Kudo, who just weren’t having fun anymore and are now home with their loved ones. I thought of the 1377 miles I’ve walked and of the 806 remaining. I thought of the good days and the bad. 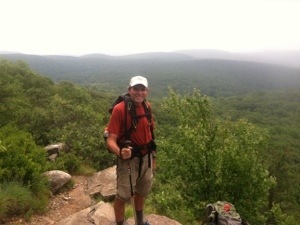 So even though I kind of envy my fellow thru hikers who have returned home, I will continue. Despite the pain, frustration, and mental fatigue, there’s a finish line that needs to be crossed on a mountain in Maine. I will continue. I suppose every adventure needs a little adversity. So today I hiked out of Vernon, NJ with one pole, a sprained hand, and a sore right shoulder and lower back, prayerfully. The day began two hours earlier at The Mixing Bowl. The only thing that would have made my hearty country breakfast better was grits. I got a smile before the “no” when I asked. Several local diners were talking about the trail. 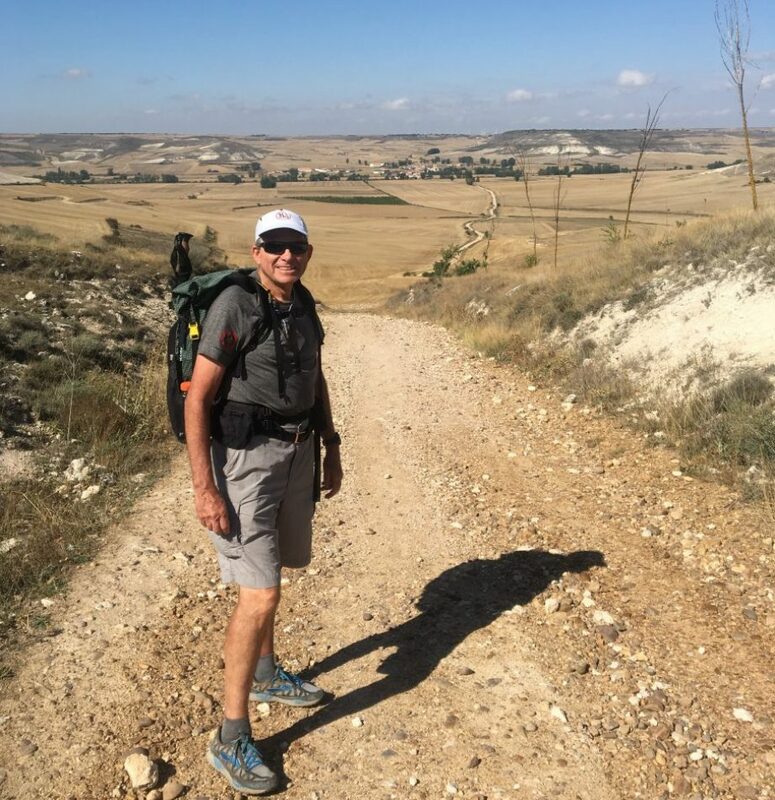 When one said he couldn’t believe anyone would walk over 1350 miles to Vernon, his buddy said it was no different from walking around a golf course every day. Excuse me! Did I really hear that? I just drank my coffee and kept quiet. After breakfast I walked back to the hostel to pack up. Everyone was still asleep when I crept out a little after 6:00. When I returned a few continued to sleep. The youth show no urgency in getting their day underway. Lentil and Pfeiffer, the only ones out the door with me, sought a ride back to the trail at a corner convenience store. I chose to put my thumb out up the road a piece. After about ten minutes a truck stopped. The driver, who later introduced himself as Walter, told me to quickly get in. “There are state troopers all over today,” he stated. “The governor is expected in town.” Apparently hitching is illegal in New Jersey, so he was trying to get me off the street. I thought it was only against the law in New York. Since Lentil and Pfeiffer had not gotten a ride yet, I asked Walter if he would mind giving them a lift also. He gladly turned his truck around to pick up the two. When we got to the AT, the two quickly hiked into the distance. 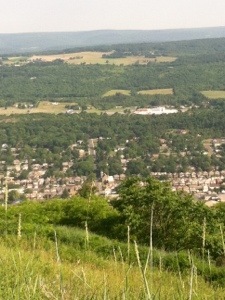 The climb out of Vernon requires about a 1000 foot ascent up Wawayanda Mountain. 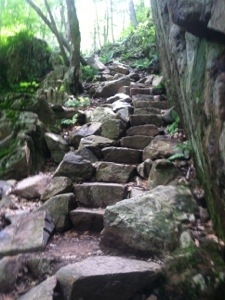 Many refer to it as “The Stairway to Heaven” since so many stone steps aid in the climb. With only one trekking pole, I found myself grasping for large rocks to help with balance. Taking my time, it took awhile to reach the Pinwheels vista at the top. Seated on a rock were Leigh and Ed. Leigh asked if I were a thru hiker, so I told them about my hike and Don. The next couple of hours went well. I saw ridge runner Grasshopper for the second time. 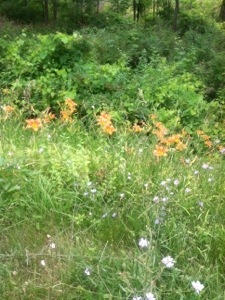 Then I took a break at Warwick Turnpike (I’m not sure why a two lane road in the country is called a turnpike). Just as I was heading up the trail, I heard someone yell my name. Rapidly moving toward me was none other than Chin Music. We had been near each other for a good while but had never met. So for the duration of the day I again had a hiking partner. Also a member of the trailjournals community, we have many of the same followers. Within minutes I felt like I had known Chin for years. In addition to the camaraderie, I was just relieved to know there would be another hiker around when the New York rocks greeted us. As we hiked toward the state line, we shared some data about our lives. When I told my new friend that I was a retired English teacher, I didn’t know at the time that Chin Music and I would be bouncing over the rocks discussing semi-colons. I was glad to oblige and explain various rules since the discussion briefly took my mind off the severity of the rocks. Chin equated some portions to walking across a slanted roof. Nice metaphor, Chin. So across the rocks we bounded for a lot longer than I had anticipated. Each time I thought they were over, another series of the slanted monsters appeared. In many ways I think only having one pole today benefited me. I often used my free hand for leverage when pulling myself up to the next ledge. At one point I didn’t think I was going to make it around a sloped rock face with no room for error. Chin braced himself in a position that gave me someone to keep me from falling if I lost my balance. Thankfully, no falls occurred today. At one point an aluminum ladder was stationed next to a precariously dangerous rock slab. The assistance was appreciated. It was also good to have a hiking buddy for photo opts. Like yesterday, the heat and humidity prevailed. There were fewer mosquitoes; however, I still received some fresh bites. One thing that I’m finding recently is how tired I get by early afternoon. I definitely could have used some more water. 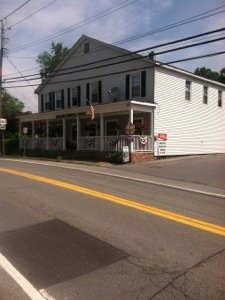 When Chin and I finally reached NY 17, we walked the two hundred yards or so to the Creamery. 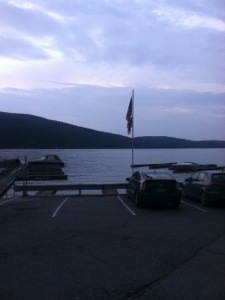 After a water and root beer, I struck up a conversation with a former soldier, Gene, who wound up giving me a ride to Greenwood Lake and the Breezy Point Inn. I dined on the patio with a view of the lake. It’s been a good day. I met a new friend, completed a difficult section of trail, and didn’t fall all day. 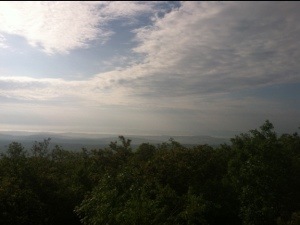 Indeed, it proved to be another special day on the Appalachian Trail. Today would be in serious competition for my most miserable day on the trail. Not due to the terrain. Just as Steady had promised last Sunday, up around the bend, the Pennsylvania rocks finally ended, 45 miles into New Jersey. The reason for my miserable state had little to do with the trail and everything to do with the heat, humidity, and the mosquitoes. If anyone would like to try and simulate what I experienced today, let me suggest the following: Find a place with a 90 degree temperature and 100% humidity where mosquitoes are swarming by the hundreds. Now walk around in that environment for around nine hours. One fifteen minute break in an air conditioned room is permitted. 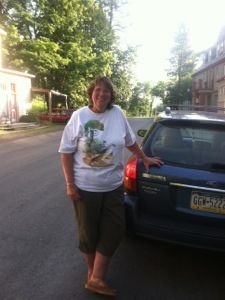 My day commenced with a final Port Jervis taxi ride back to High Point State Park. It was the first that was more than $5. 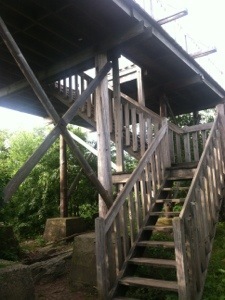 One mile into the hike I stopped to climb a wooden tower with a platform and view of a tower which sits at the highest point in New Jersey at 1701 feet. 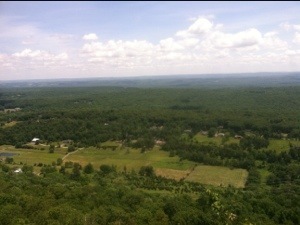 From there I hiked steadily, crossing several roads and swatting bugs as the heat increased. After the rocks diminished, the trail became a fairly flat, soft path for most of the morning. It would have been a pleasant hike on a cooler day. Unfortunately the army of mosquitoes had only recently invaded the area, or so I was told by a local. When I reached Lott Rd. 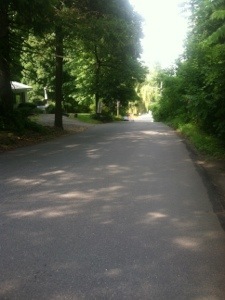 I walked the half mile into Unionville, New York. 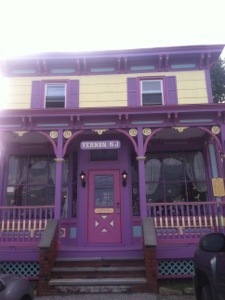 The trail continues in New Jersey; however, it is so close to the line that some trail towns are in New York. At Horler’s Store I ordered a turkey sandwich on wheat for an early lunch with a Dr. Pepper. 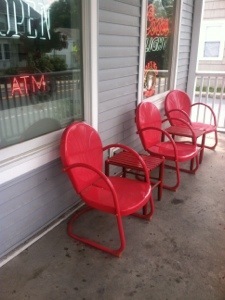 I sat in an old red porch chair on the front veranda. Also at the store were Johnny Walker, Sinner, and Banzai. I had not seen my old friend Banzai since before the Shenandoah’s. My break from the heat and bugs was short-lived. When I walked back to the AT I was immediately attacked by a small battalion. I made numerous kills, but many in the army struck me as well. Sweating profusely and covered in Deet, I tried to outrun the pests unsuccessfully. At one point I put on my head-net, which at least kept the critters out of my face. What made matters worse was that the trail passed near water most of the afternoon, especially around the Wallkill Reserve. After the swampy walk around the Reserve, Pochuck Mountain awaited. Ascending about 700 feet, this was the only challenge of the day. It was here, however, that I again suffered what could have been a serious fall. Due to fatigue, I think, I failed in an attempt to pull myself up on a knee level large slab. As a result I lost my balance and fell backwards on another large rock. This fall evoked no humor. It hurt a lot. My right hand jammed underneath my body as my shoulder hit the rock. 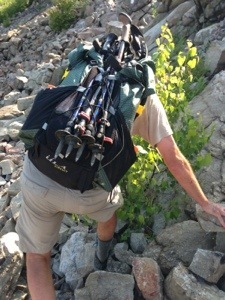 And what made matters worse was that I snapped one of my trekking poles. The mosquitoes showed no remorse, sending in reinforcements for multiple strikes as I lay motionless on the ground. Did I say it was miserable? So with one pole, thoroughly soaked with sweat laden clothes, and triple figure mosquito bites, I painfully proceeded to County Rd. 517 where I took a short break to reaccess the potential injury. From there I first had a boardwalk hike followed by a cow pasture crossing before arriving at NJ 94 and Vernon, NJ. I then walked the hundred yards or so west to Heaven Hill Farm, a combination nursery, farmer’s market, and deli. I ordered a barbecue sandwich and root beer which I enjoyed on their patio. 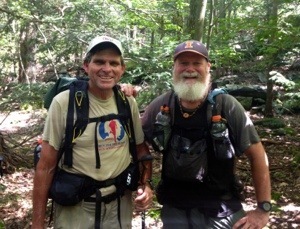 Land Line, a thru hiker who is trying to beat his own thru hike personal record of 74 days, joined me. 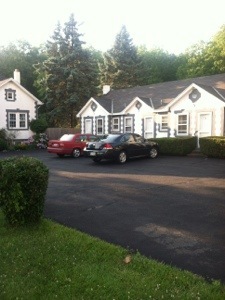 After the meal, Mike, the deli owner offered a ride to the Episcopal Church Hostel in Vernon. Several others are at the hostel with me including Banzai, Lentil, Pfeiffer, Lucky, and Fis. All are young folks. After a shower I walked to a grocery store and now am writing this in the only fast food restaurant in town, a Burger King. Darkness has arrived. I’m about to order a burger and then walk the two blocks back to my home for the night. Today was a tough one, but I’ve bought more bug spray so that I’ll be ready for those varmints as I hike out of New Jersey and into New York tomorrow on the Appalachian Trail. I’m on a train, the Metro North/New Jersey Transit. The Hoboken Line. Destination, Penn Station. Speck sits beside me. Her second section hike of the summer has come to an end. Across the aisle sit Medicine Man and Kudo. All three of my hiking buddies are headed to LaGuardia. Medicine Man and Kudo will fly to St. Louis; Speck heads to Atlanta. I’m going into the city for a special visit. I’ll ride this same train back to Port Jervis later today…alone. For my friends, home and families await. For me, it will be back to the trail community. 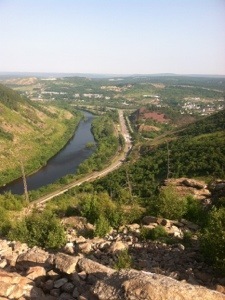 I will find a way back to High Point State Park and walk solitarily toward Vernon, NJ. But for now, life on the AT is temporarily suspended. Time stands still. I look through the window at distant ridge lines. Their heights decrease the closer we get to Manhattan. The conductor announces the next stop. Commuters board every time it does. Each takes out a cell phone, or iPad, Kindle, or paperback. All look downwards, just like I’ve daily focused on my feet, and the ground, as I hiked. The train whistle blows. I reflect on the past, think about future days on the trail, but try to live in the present. I have only hours, minutes, to offer well wishes, say good-byes, embrace a moment in time that will never be repeated. The train slowly moves into another station. Again the whistle blows. In many ways I envy my friends who are headed home. In others, I long to be back on the trail. We arrive at our destination, Penn Station. I say goodbye to Speck, Medicine Man, and Kudo at the intersection of 31st St. and 8th Ave. The Joe Louis Plaza. I shake the men’s hands. I hug Speck. I’ve stood here before. I love New York. There are no white blazes, but for some odd reason, I feel more comfortable navigating the NYC subway system than the rocks of the AT. There’s less chance I will fall on the streets of New York. Perhaps I am an enigma. I have over an hour to kill before the meeting. While my friends head north toward Central Park and eventually a cab to the airport to make mid-afternoon flights, I walk south toward the West Village. It’s a beautiful day in Manhattan. I walk south on 7th Ave. Sidewalk vendors sell their wares. There’s a fruit stand every block. Food is plentiful. Ah, for an available piece of fruit around every bend on the Appalachian Trail. That would be good. It’s hot. I get to 23rd St. and decide to take a cab the rest of the way. I don’t want to be late. The driver is courteous and jolly. I’m grateful. I arrive 15 minutes early and text Rachel. She comes outside to meet me. I haven’t seen her since the first weekend in March. We hug hello. It’s a bittersweet moment, knowing how brief the visit will be. I’m quickly propelled into the working world of my daughter. I momentarily become the center of attention for a group of strikingly vivacious young ladies. They all have beautiful smiles. All are interested in my hike. 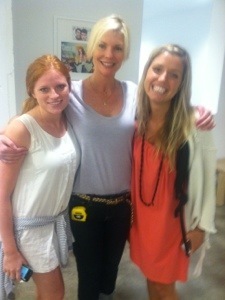 I meet Lauren, Meg and Amy. Then I’m introduced to Madison and Teresa. In the next room I’m greeted by another Amy, Rachel’s boss, who interrupts her meeting to emerge from a glass conference room to talk. I meet Mary and Dustin and others whose names I unfortunately can’t remember. These aren’t trail names. These are real people in the regular world. They could be Rocket or Finder or Paisley or Fatty or a number of other young ladies, if they were hiking the Appalachian Trail. I see my daughter’s office and am a bit overwhelmed by the magnitude of the company for which she works. We leave to walk to lunch. I’m reading a distinctly New York menu at Westville. I think of another time, when a nine year old sat across from me at a restaurant in Park City. We order and chat. 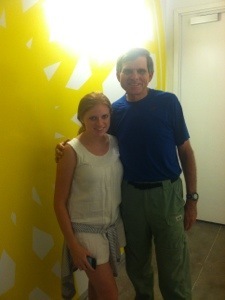 Rachel tells me about her incredibly busy world at SoulCycle. I talk about the hike. We speak of the uncle she loved so much. We smile a lot and enjoy the moment. Lunch goes much too quickly. We walk back to her office. I chat with a few others. We take a picture. Rachel walks with me to the corner of Leroy and Hudson. We hug tightly and exchange I love you’s. She walks back up Leroy toward Greenwich. I turn to watch for a few seconds more before heading up Hudson. I’m simultaneously happy and sad. The two hours with my daughter have become a memory. I begin walking north on Hudson. There are no blazes. I need none. I’ll turn east to 8th Ave. at W14th St. and keep walking to 31th St. and Penn Station. I pass the Bus Stop Cafe at Bethune and remember the brunch there with Rachel and Sam. I notice the Apple store at the corner of W14th, where Rachel and I stopped on the cold January afternoon I left her in her new city before I drove back to Georgia. I think of all that has happened in the past two and one-half years. I see two women walking dogs. They smile when I ask to take a picture. Lindsey, a beautiful young lady, shows interest in my hike and says she will read my journal. I move on. The sun beams down. 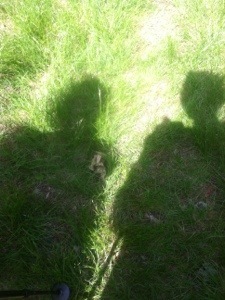 I think of a day last week when I saw only two other people over a ten hour period. Today there are tens of thousands marching through time on cement sidewalks. They have no blazes to follow; still, they find their way. I’m back on another NJ Transit train, traveling in reverse the same route Speck, Medicine Man, Kudo, and I travelled this morning. Their flights are near completion. Their families wait. The coach is crowded. The train rolls between one small hamlet and another. Passengers depart at each stop. Outside, clouds and haze have replaced the sun. An older gentleman across the aisle watches a video on his iPhone. The voice sounds like a five year old granddaughter. He has no expression. I wonder why. I nap. 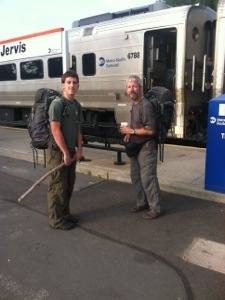 The gentleman to my left wakes me at Harriman. Commuters depart at each stop. A once full train is now nearly empty. 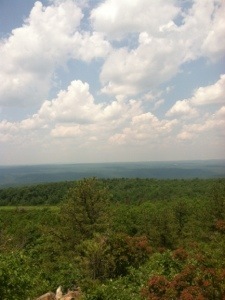 I sit alone, gazing at the ridge lines in the distance. They are increasing. I am nearing the trail. 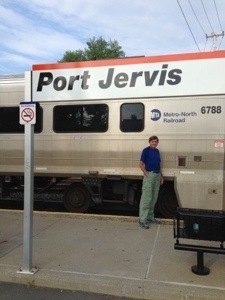 The conductor announces, “Port Jervis, last stop.” I walk from the train. It is raining. I pass by the Burger King where only eleven hours earlier I had shared a meal with three fellow hikers, now friends. I call a cab. I stand near a puddle waiting. I ride back to the motel to remember. It has been a good day, a special day, but a day that now has become a memory. I will rest well tonight because tomorrow a hike needs to be resumed as the northward journey continues up the Appalachian Trail. The tell tale sign that another hiker was stirring, air being let out of a mattress, awakened me after a surprisingly good night’s sleep. I checked my watch to discover that it was 5:00. It was Pfeiffer’s mattress I heard. Pilgrim was already at the picnic table cooking breakfast. Speck sat up on her pad. Bob was also stirring. Medicine Man, Kudo, and Lentil appeared to still be sleeping. Oppressive heat already filled the air along with the pesky bugs. I immediately knew that it was not going to be a comfortable day for a hike. My instincts would prove correct a few hours later. Having chosen to sleep in my one pair of long hiking pants and only long sleeve shirt, to try to deter the pests from striking, I needed to change clothes. 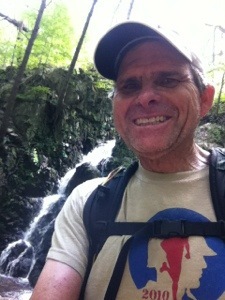 I quickly removed my pants to put on my still wet from perspiration hiking shorts. There is little modesty in shelters. I then pulled my even wetter shirt from the makeshift clothes line and donned it as well. 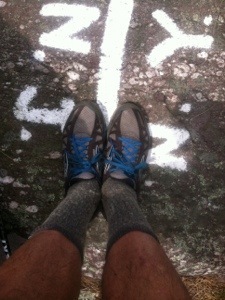 After packing up my sleeping bag, pad, and clothing, I laced up my trail runners over my disgustingly filthy socks. They had been clean yesterday. So with a pack ready to hoist onto my shoulders, I sat down for breakfast. Even though I realized that I needed something nutritious, I could only manage to eat one cereal bar. So after the meager breakfast Speck and I left camp a few minutes before 6:00. Only Pilgrim and Bob preceded us. I was glad that today’s hike was short. The trail offered absolutely nothing of significance. I took only one picture all day. More rocks, sometimes pointy, covered a portion. At other times the trail was barely visible due to various foliage that had practically overtaken the path. Speck and I climbed a few larger rocks, but those minor sections fell way short of offering anything in the range of exhilaration. I fell twice. Speck showed concern. I laughed; she laughed. I’m beginning to wonder if I have a balance issue. I seem to be tripping when there’s nothing there. Even though I keep hearing my buddies back home saying, “Stay vertical,” it’s hard. The only noteworthy view occurred at Sunrise Mountain where a pavilion had been erected. The sun had already risen and the bugs had begun their relentless attack, so we didn’t pause for long. The bugs must have had no interest in the view either. They pursued Speck and me ruthlessly as we ambled on up the trail. By the time we got to the Mashipacong Shelter, we both had multiple bites on our arms and legs. The Deet wasn’t working. Neither was the swatting. We did stop briefly for a snack. Pilgrim, who we had passed earlier, and later Lentil, arrived before we moved on. Pilgrim removed his bug head net so that he could apply some bug spray that Speck had given him. The critters were a menace to all. 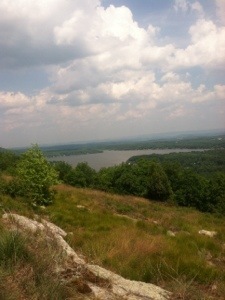 So on we went, hiking and itching all the way to High Point State park Headquarters at NJ 23. The Spirit/Steady RV was in the parking lot. After talking with Spirit, Speck and I walked into the air-conditioned building to sign in as hikers and receive a complimentary Pepsi. 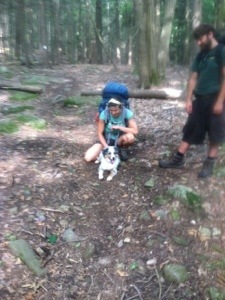 Also outside were section hikers, Jocko and Pepper. Before we moved on Lentil and Pfeiffer hiked up. I remember this park from my section hike with Alton. This is the spot where our Michigan friend Ponder thought he missed a blaze and did a circuitous route to get to the building. I made sure I didn’t make that mistake. It was too hot to have to repeat even ten yards of the AT today. Since it was early and we had been promised a ride by “just north of Manhattan” Bob, Speck and I relaxed in some shady grass until he arrived. Having covered the rather short 11.3 miles before noon, we were really in no hurry. To make certain that he hadn’t already gotten there via a different route, I walked on up to the parking area for hikers to check. A few minutes later Speck and Bob arrived. Once again a trail angel helped this “poor old can’t keep his balance hiker.” Speck and I were grateful for Bob’s kind act since he still had an hour and a half drive to get home after his section hike. So now it’s only late afternoon. I’ve had a good meal, some ice cream, two root beers and a Mountain Dew, and I’ve done my laundry. I’ll still have some supper later. Unlike last night, I’m in an air-conditioned room wearing clean clothes. I’ve had a shower and smell good. I’ll sleep in a bed tonight, alone rather than in the company of seven other hikers. 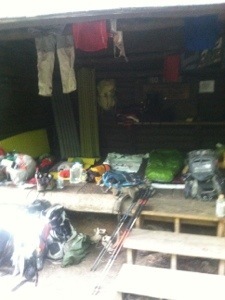 My room is larger than last night’s shelter. It’s exponentially more comfortable. Need I say more. Hiking has been and will continue to be my life for hopefully about two more months. Tomorrow, however, I’m taking a bit of a detour. 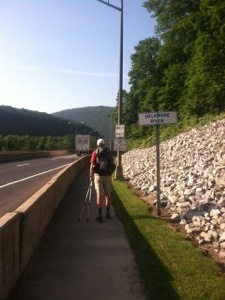 Stay tuned to see what happens when Don’s Brother takes a walk of another kind a little east of the Appalachian Trail. I’m sitting on a blow down at a campsite in the woods. It’s 7:17, sticky warm, and rain is in the forecast. 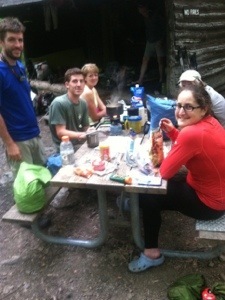 Several hikers are gathered at a picnic table, some cooking supper, others just visiting. Mosquitoes are in the vicinity. I’ve used bug spray. It hasn’t helped. My red shirt, covered in perspiration hangs from a makeshift clothesline in the Gren Anderson Shelter. I’ve put on a dry shirt but will probably sleep in my damp hiking shorts. Because of the expected warm night, I’ll sleep on top of my bag rather than in it. There are eight slots in the shelter. All are full. Looking into the shelter from left to right will be Pilgrim, Lentil, Pfeiffer, Speck, Don’s Brother, Kudo, Medicine Man, and Bob. It may be a tough night for sleep. The day began with a shuttle back to the trail from Shamrock. Light Bird, an injured section hiker, was also in the truck. A doctor and soldier who has been deployed four times, Light Bird has been sectioning for a few years. He and Shamrock both expressed concern and compassion when I told them about Don. I thanked them both before heading up the trail with Speck. Shortly after the day began we saw Medicine Man and Kudo resting by a brook. For the remainder of the day Speck and I would hike off and on with the two. The trail today consisted of a couple of sections of medium size rocks, more small rocks, some pine straw areas, and a few ridge views. 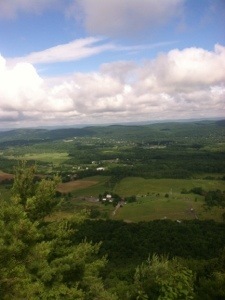 Rattlesnake Mountain offered the best view of the day. Speck and I took a break there to just relax and enjoy. Despite the intense heat of a 93 degree day, all was good. I drank water and gatorade regularly. Still it was tough to stay hydrated. When Speck and I reached Culver’s Gap, we walked about 200 yards up the road to Gyp’s Tavern. I’m not sure who Gyp was; however, there is an autographed picture of him with Babe Ruth in a glass case. I had one of those, “I need to call my brother” moments. Don would have loved hearing about the pictures of the Babe. I miss those baseball conversations that we had so regularly. Gyp’s is a real nice place. The tavern owners have made it real easy for hikers to find their way around. Signs were posted that told us where we should leave our packs, where we could enter the tavern, and where we should and should not sit. Before Speck and I ordered, Medicine Man and Kudo arrived and joined us at our table. I ordered a burger, fries, and a turkey sandwich for the woods. Along with a root beer over ice, it made for an outstanding meal prior to the walk to the shelter. Before leaving the establishment, a local patron suggested that I take a bottle of whiskey rather than my re-filled water bottles. On the final three miles to the shelter, Speck and I paused briefly to chat with a section hiker from Capetown, South Africa. Then we tried to pick up the pace as thunder could be heard in the distance. 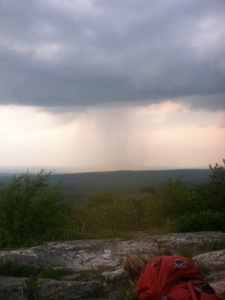 A light shower began just before we hit the short blue blazed trail to the shelter. When we walked up, Bob, a section hiker from just north of Manhattan, Lentil, and Pfeiffer were already inside. Shortly after we got here, Medicine Man, Kudo, and Pilgrim also arrived. So the eight person shelter is at capacity on a steamy night. Darkness is approaching. A large group of young folks, who apparently drove to the campsite and are tented nearby, are noisily enjoying themselves. My shelter mates are trying to get comfortable in a cramped environment. I am sleeping in the woods and all is well. Kudo to my left is gazing toward the bear box. Speck to my right is busy with her phone. Pilgrim and Pfeiffer are still seated at the picnic table with Lentil. No one is asleep. I’m not really tired and doubt that I’ll sleep much tonight. Still, all is good. I’ll wake at dawn, pack up with the others, have a little breakfast, and head north for another day on the Appalachian Trail. 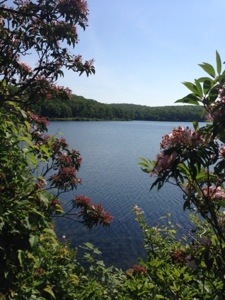 DWG to Blue Mountain Lakes Rd. On a cold, rainy morning three months ago today, I set out from Springer Mountain in GA to attempt a thru hike of the Appalachian Trail. On that March day I must admit there existed an inkling of doubt that I could accomplish the task. Now 93 days later the doubt is gone. As long as I can stay healthy, I feel the goal will be reached. Even though I sometimes wonder how I continue to follow much the same routine day after day, I do. So as I moved into my eighth state at the beginning of my fourth month on the trail, I hiked happily on a beautiful Sunday afternoon. 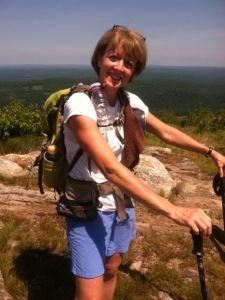 Trail Angel Dolores again aided my hike as she delivered Speck and me back to the trail at the Water Gap this morning. Today’s hike began with a bridge walk across the Delaware River into New Jersey. The trail passes the Kittatinny Visitor Center before moving under I-80 toward the trailhead. In the parking lot adjacent to the trail sat the RV of Spirit and Steady. Both came out and I introduced them to Speck. 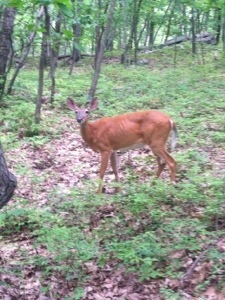 Shortly thereafter Speck, Steady, and I headed into the woods. 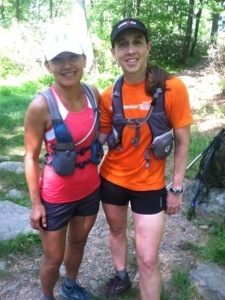 We quickly began meeting and passing day hikers and trail runners. After about four miles we reached the south end of Sunfish Pond. The still water amidst the picturesque landscape created a peaceful setting. As we stopped to admire the beauty, we were engaged in conversation with Sophron and Carrie, two runners from the Philly area. Three young men from Long Island were also taking a break. When we left the others, we missed a blaze and got off trail briefly. 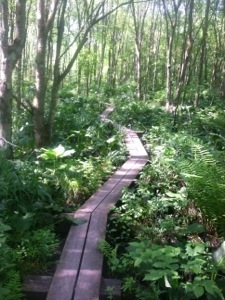 When we retraced our path, however, we found the blaze and continued to hike near the pond. 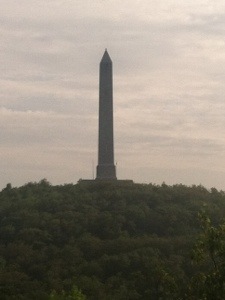 Even though we have officially left Pennsylvania, the small pointy rocks continued. Steady kept saying they would cease around the next curve, but they didn’t seem to be honoring Steady’s wishes. 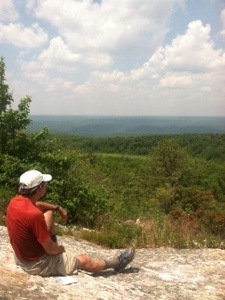 The best view of the day happened at the rocky summit of the Kittatinny Mountains. There we chatted with ridge runner Grasshopper for a little while. When we got to Camp Rd., Speck, Steady, and I stopped for some lunch. 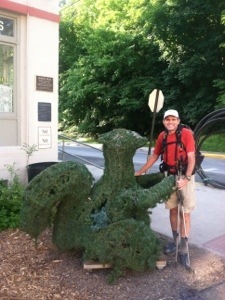 While we ate, Pilgrim arrived, but he was headed up the road to the Mohican Outdoor Center for some food. For some reason it seems that lunch may be my downfall since for two consecutive days, I’ve fallen during or right after lunch. Speck laughed, and I went ahead and laughed along with her, when I just tripped over an innocuous rock step at the very beginning of the next incline. Stumbles is several days ahead of me, but I’m challenging her for her trail name. At the Catfish Lookout Tower two couples were taking a break from a day hike. We offered help with a map and told Joe, David and their wives about our hike. I also shared my website and information about Don. The four hiked on with us for a short while before we moved ahead. Then we hiked by a swamp and saw where beavers had spent what appeared to be a lot of hours damming up a stream. Past the stream the rocks all of a sudden seemed much less prominent. 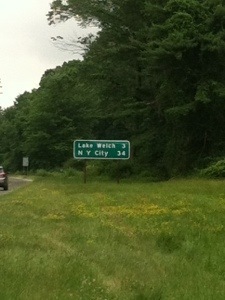 We made good time from there, arriving at Blue Mountain Lakes Rd. before 4:00 to complete a 17.7 mile day. Speck and I had enjoyed hiking with Steady today. We said our goodbyes and he headed on up the trail looking for a campsite. Within a half hour Bob (Shamrock) picked us up for a shuttle back to Stroudsburg. A retired high school teacher like myself, Bob shared information about the area. A hiker as well, he said his shuttle business had been booming the last couple of days. With an interest in baseball and golf, we discussed both on the drive. So as my hiking day came to an end, I reflected on my three months on the trail. In some ways it feels like three years. At times it still feels like I am stuck somewhere between the regular world and a dreamlike state. I wonder if there isn’t another me still living my other world life as I continue to participate in this grand adventure. I’m sure I’ll keep trying to keep a fresh perspective as tomorrow rolls around. 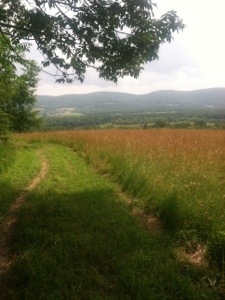 It’s very late at the moment, but tomorrow another day of wonder awaits as the hike continues on the Appalachian Trail. When you’ve just bounded over a series of kitchen table size boulders called Wolf Rocks, you don’t expect to suffer your first fall in over a week while having lunch. That’s just what happened on another beautiful afternoon in Pennsylvania. With a 15.7 mile day on the agenda, Speck and I first set foot on the trail today at 9:15. After a short climb out of Wind Gap, we meandered our way through the woods on a trail carpeted with more pointed rocks of various sizes. A warm sun made its appearance early in the day to remind us that we needed to stay hydrated. 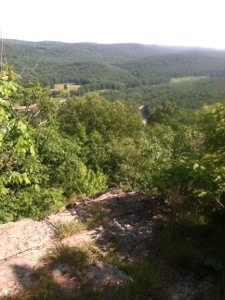 Nothing of any great significance caught my attention until we reached Wolf Rocks about seven miles into today’s hike. Speck smiled, anticipating another opportunity to do some rock hopping. Considering the mundane landscape we had been traversing, I smiled as well. I’m beginning to enjoy the challenge of some more difficult sections of trail. Even though these rocks did not pose as big an obstacle as the Knife Edge or the hike out of Lehigh Gap, they still demanded concentration. 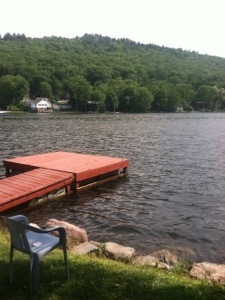 I commented to Speck that they reminded me a little of New Hampshire where you have to plan your next step. Right after Wolf Rocks the excitement for the day occurred. I had packed in a ham and cheese sandwich, fries, and a Mountain Dew for lunch. Not being able to open the Dew, I asked for Speck’s help. When she proceeded to remove the cap in about two seconds, we both began laughing. In my exuberance I tripped over a baseball size rock and fell backwards hard into a larger rock. The fall changed Speck’s countenance from laughter to concern as I sat motionless for a few seconds, unsure of just how badly I might be hurt. After I ascertained that I was OK except for a scrape on my back and a sore lower back, I got myself to my feet to eat my lunch. When I figured out that I wasn’t hurt badly, I turned my attention to the Mountain Dew. At least three-fourths had spilled. But even though I lost most of my beverage, it was comforting to know that I could finish today’s hike. As the afternoon progressed, we hiked at somewhat of a leisurely pace. At a power line we met John and Brandon who had set up a ham radio tower. When I asked John how far away he had transmitted, he said Russia. Speck and I took some pics, enjoyed the view for awhile and then moved on up the trail. 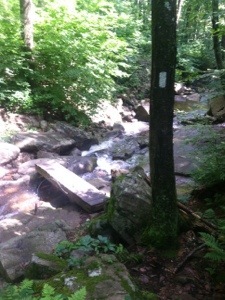 A little later we reached Totts Gap where a cooler of bottled water and mints had been left. Dolores, the mother of AT hiker Olive Oil, had also left her phone number for hikers needing assistance. I made a note of the number before signing the card she had placed by the cooler. Speck and I agreed that Dolores would be a good person to call for a ride once we reached the Delaware Water Gap. When I did reach her by phone, Dolores said that she would be happy to offer a ride into Stroudsburg in order for me to slack pack tomorrow. 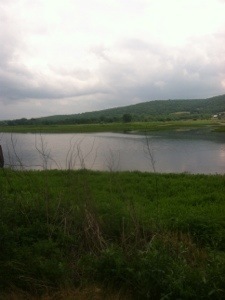 When I reached the Water Gap, I stopped for ice cream at Zoe’s before calling Delores. Leaving just as I arrived was Colin (formerly Scarecrow). He was headed back to the trail. Before I left, however, I saw Medicine Man and Kudo arrive. Pilgrim was also walking up the street. He filled me in on who was at the Church of the Mountain Hostel. It was good to know who was in the vicinity. 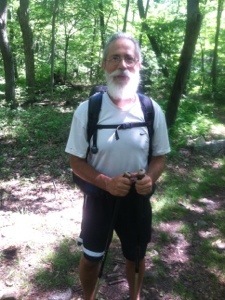 Hopefully, Speck and I will see several of the hikers on the trail tomorrow. It still seems, however, that the trail has really thinned out over the past couple of weeks. Today was another enjoyable day to hike. 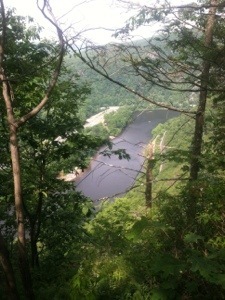 I reached the Delaware Water Gap, the last stop in Pennsylvania. Time is suddenly moving more quickly. I have now completed 7 states and have 7 more to finish. Today also put me at fewer than 900 miles to the end. Tomorrow I will walk across the Delaware River into New Jersey, the state with a very high bear population. 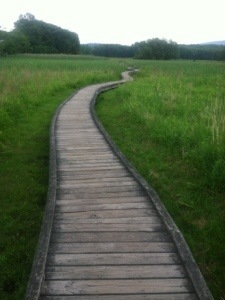 I would like nothing better than seeing one as I head toward Maine on the Appalachian Trail. 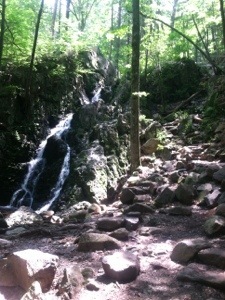 The climb out of Lehigh Gap is regarded as one of the most technical segments of the Appalachian Trail south of New Hampshire. 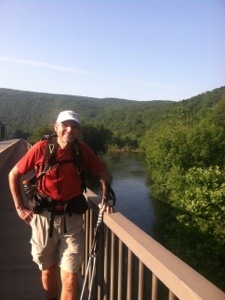 At 8:00 this morning Speck and I crossed the bridge over the Lehigh River headed for that ascent. 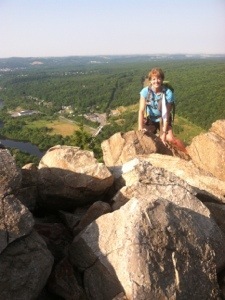 Speck had a smile on her face anticipating some real rock climbing. I had the feeling I sometimes get before a dental appointment. I just wanted to get it over with. Before the scrambling was finished, however, I was smiling as well. After all, a good hike in Pennsylvania wouldn’t be complete without a section that requires the use of one’s hands. 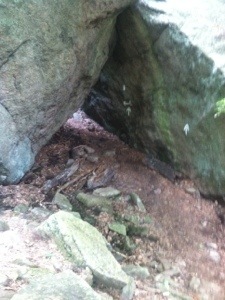 So after encountering a steep, wooded uphill for the first half hour, we came face to face with the boulder field. 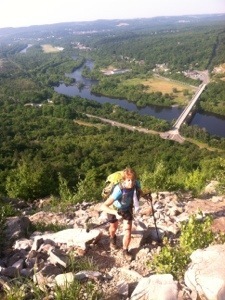 With the bridge over the Lehigh River in the background, Speck and I took aim on the final ascent. We telescoped down our poles, and Speck placed them in the back of my pack. Considering the rock face we were approaching, poles were more of a hindrance than a help. The higher we got, the more I needed to concentrate. Each upward movement required me to find the appropriate shelf to place my hands and feet. It took time, but the slower pace was necessary to ensure my safety. Speck again called the climb exhilarating. Today I called it exhilarating as well. When we finally crested the apex of the mountain after a 1000 foot elevation gain, we found ourselves at the south end of the Superfund Detour. 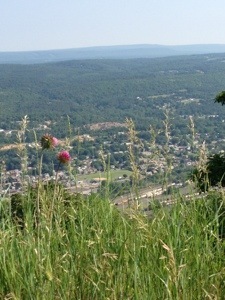 For the next three miles the trail stretched along a ridge line that afforded a beautiful view of Walnutport and Slatington, PA. The views were so gorgeous that Soeck and I stopped often to enjoy. Once the trail headed away from the edge of the ridge we had to walk over a rock bed for a short while. The detour trail not only presented better views but also steered the AT away from the old zinc mining fields. For much of the rest of the day the trail was comprised of a variety of rocks. We hiked over some short sections of rocks about the size of our packs. At times the trail became a path of pointy rocks often protruding through the grass. To put it simply, it contained rocks and more rocks. A stiff neck can be the result of having to continuously hike with your head down. Otherwise, an ankle injury, trip, or fall might be the result. Speck and I conversed some, but mainly we just concentrated on getting through these rocky sections without getting hurt. Like yesterday we saw no thru hikers. We did see a few section hikers like Andy, a young lad from Newcastle, England. When Speck asked him if he had a trail name, he didn’t know what she meant. Dressed in a purple fleece and long, heavy looking camo pants, Andy said he started in New York and was ending his hike in Charlotte. When I told him that Charlotte wasn’t exactly on the AT, he replied that he realized he would have to leave the trail eventually and walk east. We wished him well before hiking on. As the afternoon waned we saw one extremely long black snake. He had to be seven feet in length. It was the second snake we’ve seen this week. I forgot to mention on Wednesday the timber rattler that was curled up about a foot off the trail. At first I thought he was a black snake as well until Speck pointed out his markings underneath. In addition to the snakes, we’ve also seen some wild turkeys, hawks, and a few other familiar critters. And we continuously hear the incessant singing of the cicadas. Speck seems to like their song. I wondered if Odysseus’ Sirens may have created a similar sound. Hiking at about 2.5 miles per hour throughout the afternoon, we finally reached Hahns Overlook, the first view since early this morning. 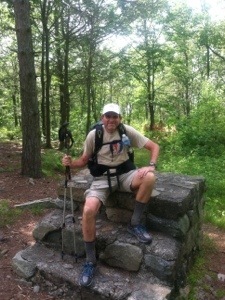 With only a mile left in today’s hike, we only paused briefly to chat with ridge runner James. 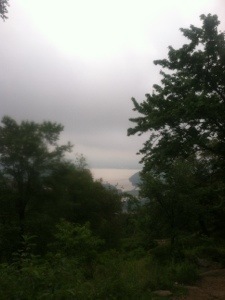 From the overlook we quickly hiked the final mile into Wind Gap, finishing the 20.8 mile day at 5:30. For the three days I’ve hiked with Speck, we have averaged 20.1 miles per day, a very good pace, especially considering the rocky terrain. 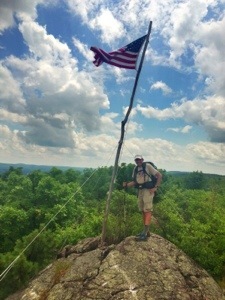 It’s good to have some tough sections behind me as I hike my last day in Pennsylvania tomorrow up the Appalachian Trail.